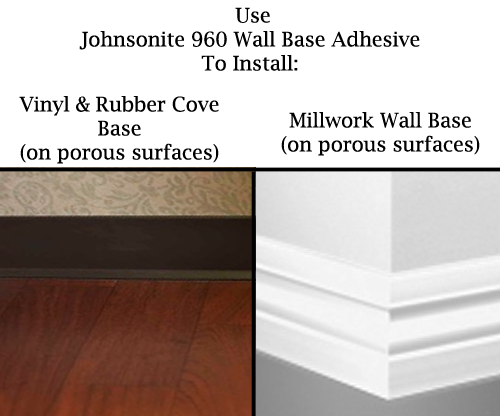 Johnsonite cove base adhesive is specially formulated to be used to install Johnsonite brand rubber and vinyl cove base, millwork wall base, and more. This acrylic water-based vinyl baseboard adhesive should be used when installing wall base on porous surfaces, such as drywall. When installing cove base with the Johnsonite 960 wall base adhesive, surfaces must be smooth, flat, dry and free of dust and paint. Prior to use, cove base adhesive must be site conditioned at room temperature for a minimum of 48 hours prior to using. This vinyl baseboard adhesive cartridge is sold in a 30 oz tube, and cannot fit a standard caulking gun. This wall base adhesive must be used in a 30 oz adhesive gun. Nonflammable, solvent-free, acrylic water-base adhesive. The Johnsonite 960 wall base adhesive can also be special ordered in gallon and four gallon pails. Please contact us for pricing. 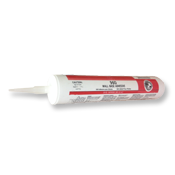 This cove base adhesive is specifically made to be used on porous surfaces. If you have a non-porous surface, please refer to the Johnsonite 946 Contact Bond Adhesive. **These items are special order and not listed on our site. Please contact us for pricing and more information. We carry everything you need to install wall base without any hassle! Browse our full line of installation tools and accessories.